14ymedio, Antonio Tang Baez, Montreal, 13 February 2019 — When the acoustic attacks suffered by American and Canadian diplomats in Havana were made public, Washington evacuated most of its diplomatic personnel. Ottawa, on the other hand, withdrew only — and even that reluctantly — those affected and understated the suffering and damage to diplomats and their families. The Ministry of Foreign Affairs even continued to send relatives and children, regardless of the damage to health, while those already affected back in Canada were not provided with the medical attention they required. The Cuban Ministry of the Interior was the first to launch the theory that the noise was the sounds of crickets, which reappeared later in an obscure study published in the United States. The Royal Canadian Mounted Police (RCMP) agents sent to Cuba accepted that theory and said they had not found anything abnormal. The disaster came a few days ago with a lawsuit against the Government of Ottawa by some of the affected diplomats, who demanded compensation from the state of 28 million Canadian dollars. The prime minister said that his country is seriously examining the situation. The only thing lacking for a total collapse in relations between Canada and Cuba is for a Canadian tourist to suffer a headache because of a cricket, and the entire Canadian tourist industry centered on Cuba will collapse. Trudeau acted irresponsibly by not withdrawing diplomatic personnel in time, as did the Ministry of Foreign Affairs when it sent back whole families, including children, to Havana, with full knowledge and proof that unexplained situations were occurring that were affecting the health of the diplomats. 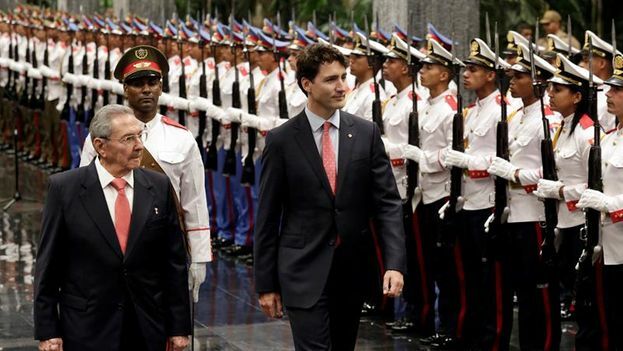 It seemed like a well-deserved vacation for Josefina Vidal, the brand new Cuban ambassador in Ottawa, a friendly country and the largest source of tourists to the island, with a welcoming prime minister. But everything fell apart. Trudeau can not justify the attacks against his diplomats in Havana, the RCMP has shown its inability to prevent further attacks or to recommend an evacuation of personnel, and, incidentally, has left the prime minister in a ridiculous situation. Translator’s note: The original title of this article in Spanish is: “La olla de grillos de Justin Trudeau.” Olla de grillos — literally “pot of crickets” — is a Cuban expression that can be translated as “madhouse,” “pandemonium,” or, in this case, “hornet’s nest,” which keeps the idea but simply changes the insect. Next Next post: "There’s No Cement"